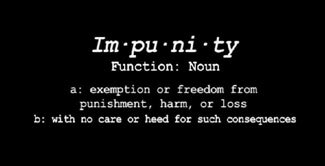 If impunity is defined as ‘an exemption or freedom from punishment, harm, or loss; with no care or heed for such consequences,’ would not a gap of impunity imply that there is a lack of the negative thing you criticize? An impunity gap infers that there is a space/hole located where there should be an exemption or freedom from punishment. Hence, based on your proposed concept, an impunity gap might actually refer to transitional justice mechanisms such as prosecutions, truth commissions, or some form of accountability measure for those charged with a violation of human rights. Your manifestations in fact are the exact opposite: they include ‘no genuine international or national justice mechanisms and/or blanket amnesties, etc. What you are really describing are accountability gaps. I do not address this to be petty, but because the ethnographic work conducted by transitional justice scholars and practitioners in the field have revealed that 1) justice develops in multiple spaces and 2) people’s perceptions of what constitutes “justice” can vary; particularly regarding the subject of prosecutions and amnesties. When you introduce a term that (at least to me) infers the opposite of what you are actually conceptualizing, the assessment of transitional justice practices (or lack thereof) just became fuzzier. If we want to examine the presence of impunity gaps, then we might start by defining these acts as phenomena that might not quite constitute the full existence of judicial practices of transitional justice (i.e. prosecutions), but rather the initiation or developing practice of addressing the presence of impunity. Hence, these acts may not be considered fully-realized transitional justice measures, but rather the blossoming of practices that could become institutionalized and accepted within a given state and society. I would even consider your example of either not all parties to the conflict and/or only elite or low-level perpetrators are held accountable. Something is there, but it is certainly not developed to the full extent as expected by those initiating and engaging with the transitional justice process. While I’m sure you are just using the term to be creative with your title, I actually think the concept “impunity gap” can actually be analytically helpful in describing those transitional justice mechanisms that are present, but not fully established. Shouldn’t it be better to use “accountability gap”? To be fair, I am aware that Human Rights Watch also uses the term impunity gap (see their 2007 report entitled ‘Narrowing the Impunity Gap,’ but I still think there is some conceptual ambiguity that could be tightened to be analytically helpful within the field of transitional justice.